Been asked to post a build thread on here for those who have not seen it before. 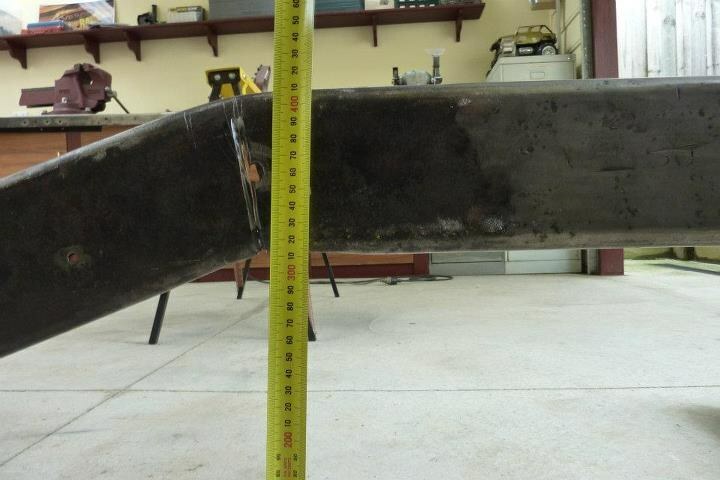 I will show some of the chassis build up as well as was some metal shaping going on there was well. If that is outside this forums focus, just let me know and I will remove those pictures. 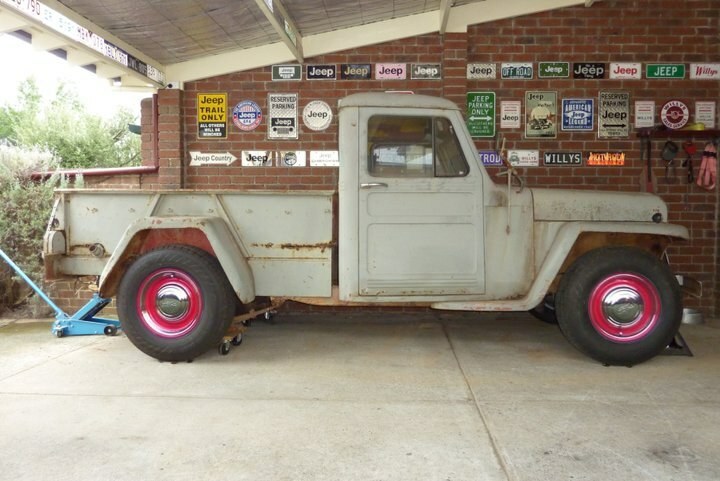 The project is about using a 1948 Willys Pickup frame and cab that will have the full running gear and as much as possible of a donor 2008 Jeep Grand Cherokee Limited added to it, both inside and out. The cab will be made 9" wider and 7" longer using parts from a 58 Willys Pickup. The over all theme is to look like a bigger Willys but 1948 from the outside and 2008 underneath and inside. After much looking and watching insurance auctions I was finally able to get a donor for the project. Ended up with a 2008 WH/WK Grand Cherokee with a 5.7 Hemi. It was first registered in 2009 and 12 months later T boned by a Harley rider doing a 100 mph! Hit it so hard that the foot well locked the throttle and he steered off the road into a paddock until he hit a tree. 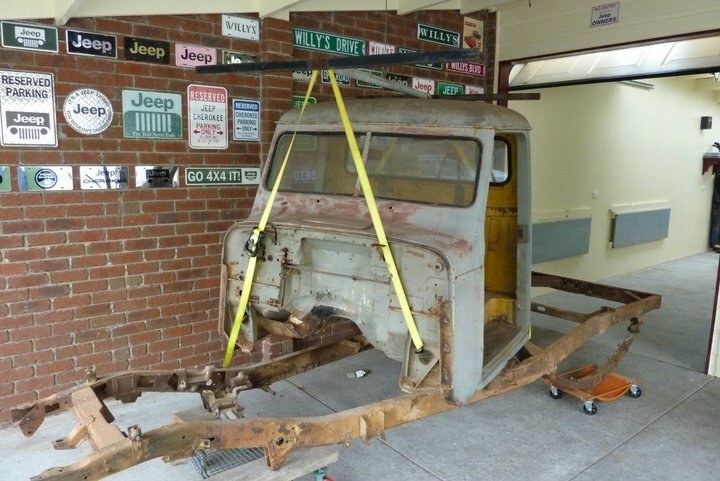 Back in December 2007 I bought a Willys Pickup off eBay, but it was a year before I got it home as had no where to store it. After much jumping through hoops with the council I built my workshop to house it. The donor was stripped down to a shell and most of the wiring with computers etc will be reused along with the full leather interior and instruments etc. You might be able to noticed how the right side of the lower firewall has been pushed across when the Harley hit it on the drivers side. This is a RHD. Just look at the size of all the dirvetrain against the big grand for reference! How am I going to fit all that under the little light weight Willys. Can see why I am making the Willys bigger to fit it all in. As I will be using the firewall and floor, I had to repair the damage from the Harley that hit the side at 100 mph according to police estimates. Thought it would be easier while still up on the rotisserie for a good working height. Also much easier to flip it up either way depending on which side I am working on. The ruler gives you an idea how much it needs to be straightened. Using a slide hammer and hammer and dolly I roughed the firewall straighter. Will come back to it later after more has been stripped off. Started drilling all the spot welds out that held the uni-frame to the floor panels. Finally after 400 odd spot welds drilled out, the floor and firewall is separated from the uni-frame. Quite substantial as 4" deep and further reinforced with another hat section inside of that as well. Good to see how well all the galvanized steel is coated through and through. Was even between each layer of steel also. I was lucky enough that some one gave me a photo of their hotrod with red steelies on at a similar angle to mine, I was able to crop the wheels out and add them to my 32" trailer tyres. Think it looks pretty good. Now as I am going to widen the whole cab 9" to match the width of the rear and cover the new front end, I want to stretch the cab length ways also to keep the proportions and get more leg room. So this is at stock length. Here I have stretched the cab around 7" through the doors which is the way I plan the lengthen it. I can use the 48 and 58 doors together to get the length I need. 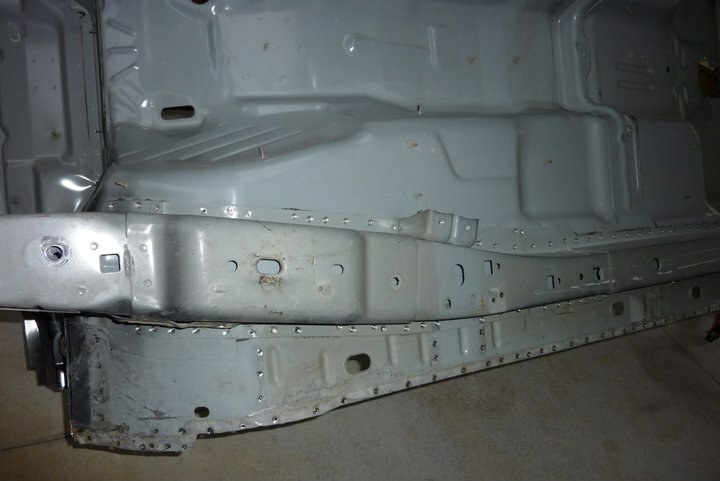 The bed has been shortened the same amount as well in front of the rear guard leaving the wheel base the same as stock. Invention is a combination of brains and materials. The more brains you use, the less materials you need. Strip down of the 58 has started. Cab coming off ready to start the frame tear down. A 1948 Willys was located interstate and my wife and I drove out there to pick it up. Slept in the back of the Jeep on the way back home. So the 48 was next to be stripped down. Main difference between the 48 and 58, apart the from front clip, is the size of the rear window. I prefer the look of the smaller winder as looks more 'hotrod' like. I will be making it 9" longer though when I make the cab wider. The 48 frame was in better condition and will be the one used in a modified state. Parts from the 58 will be used to strengthen it though. I have decided to run the 58 grille on the right instead of the 48 grille that matches the chassis year on the left. The reason is the I will be widening it and adding an extra grille slot to each side in the process. The 58 will end up with 10 slots just like the original 48 one. The 48 frame stripped down now too. With the front of the frame where it needs to be, you can see how much I will move the rear of the frame over to line up with the chalk line on the floor. Using a press I started with bending the frame. Just like in sheet metal, a puck formed that needed to be dressed out. Frame is just under 3/16" thick. Some sledge and dolly work removed the buckles and ended up with just the angle I required. Had to use a short handled sledge due to these frame rails being so thick rather than 1/8" that you find on cars of the same era. Can see now that the middle part of the frame now also follows the chalk line. Camera angle makes it look slightly off, but that is due to the front being off the ground. 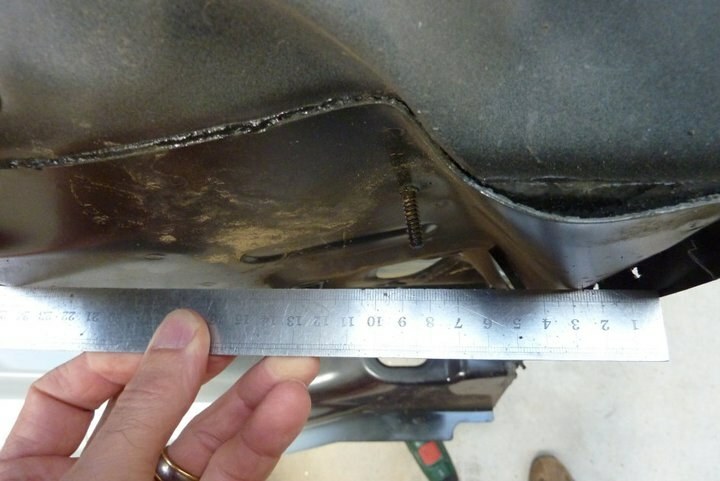 The rear of the frame had the bend pressed out of it so all inline for where I want it now to line up with the donor suspension pickup points. Last edited by Gojeep; 10-06-2014 at 05:55 PM. Marcus, you have a bit of a challenging and exiting project ahead of you. I like your idea of using late model equipment. You will have that Early rugged look with the Ohh-La-Lar comfy feeling on the inside with power to match under the throttle. Looking forward to the progress, on this one. Looks like a great project and I'm looking forward to seeing it all. Thank you so much for taking an interest in it. One of the rails had 2.5 degrees of twist in the end of the rail. So removed it by holding the rail in the press, bolting an old piece of channel to one of the existing holes in the frame where the twist was, then bouncing my whole body weight on the end of the channel. Came straight out. This is the point where the front of the Grands engine and suspension cradle will bolt on underneath. It needed to be 226mm, so need to raise the frame to match. That is around 1.5" higher than now. 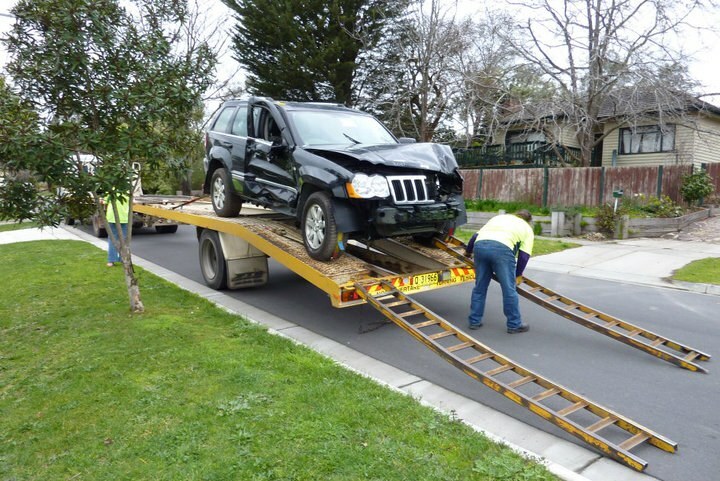 Used a triangle calculator, http://www.smex.net.au/Reference/TriangleCalc.htm to quickly workout how many degrees the bend, where it comes up from under the cab, needed to increase. Only needed just over 2 degrees which turned out to be a cutoff saw blade width. 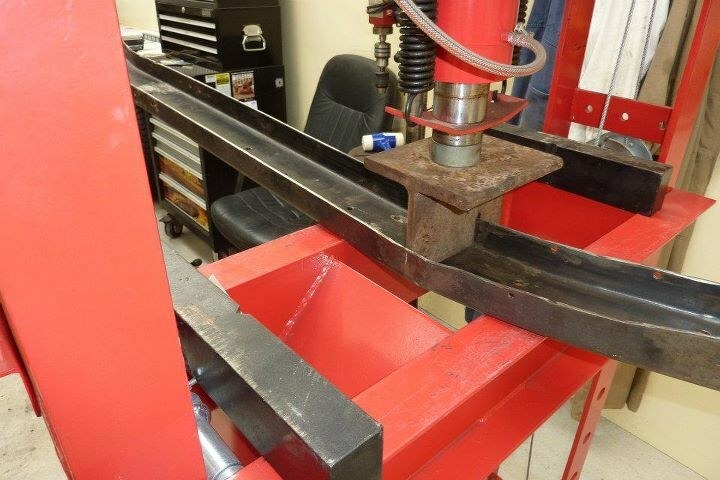 Line was scribed halfway in the curve and a right angle to it, then cut stopping an inch short of the flange. The reason I do it this way is that the bend in the lower flange will remain smoother and no obvious change will be seen. If you don't have a press, then can stop just before the flange and just pull the cut closed by hand. 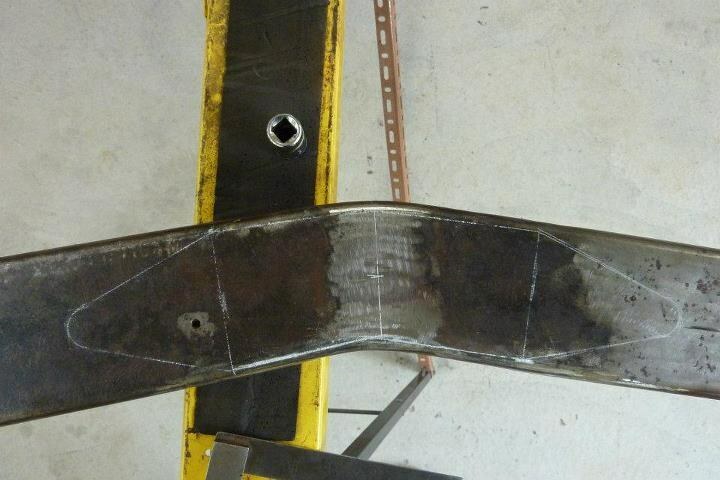 The cut was fully bevelled so full penetration will take place when it is welded back up. Then placed in the press to close the gap. Needed very little pressure and didn't distort the web of the channel. It was tacked will still in the press and then taken out and fully welded through with full penetration. The height gained was exactly where I wanted it to be. The joint will be fish plated on the back later and then fully boxed along the whole rail. The rear section over the axle needed a bigger lift for an extra 100mm/4" so I could have the full suspension travel of the donor without weakening the frame with a C notch. 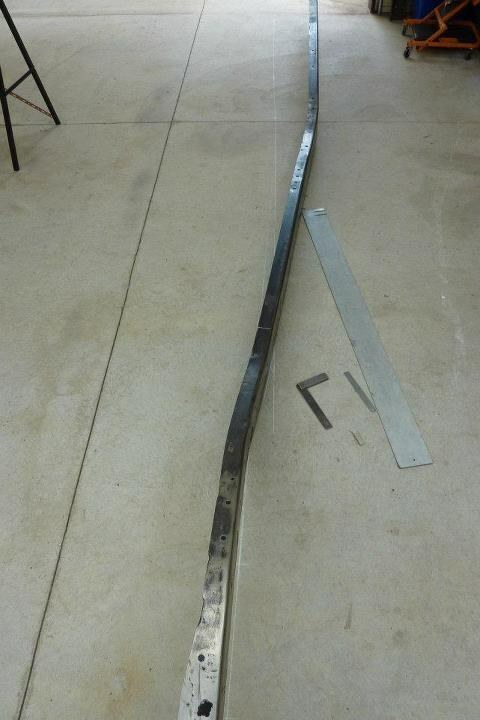 The first bend was done to kick up the rear section of the frame. Now another needs to be put in of the same degrees to level the back of the frame. The bend was put in the same way by cutting out a wedge but stopping an inch short. This gives the smoother more factory looking bend to the frame. Rear of the frame is now flat like before but 100mm higher than before. Just laying out the fish plate on the opposite side to which it will be installed. This is the way I do them using the Government Street Rod Manual as I guide and what I was taught working in the structural steel industry. Only thing changed is the radius on the ends to remove a possible stress riser there. It needs to be of the same material thickness as the parent metal of the rail, 4x longer than the height of the rail over all. Half of it will be without taper with the remaining 25% each side tapering off to a radius 25% of the height of the rail. 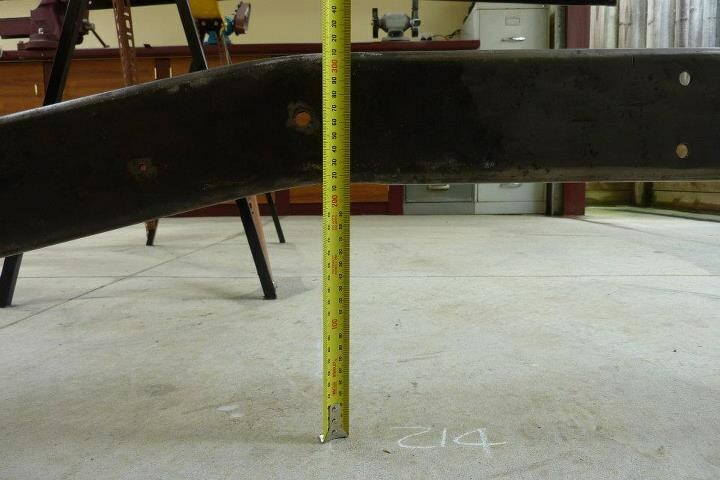 So in this case the rail is 4" high so 16" long with the taper on each side 4" long to a 1" radius. I just use a socket to draw around. The reason for the taper is so that there is a gradual increase/decrease in stiffness in and out of the bend. This stops stress risers from occurring. Same reason for rounding the ends as well, a point would cause a high stress concentration. Great detail on the build, I'll be looking forward to your updates! Very detailed project. There's a lot of engineering going on. You must have been planning this out for a long time. This project's got it all. Great job. 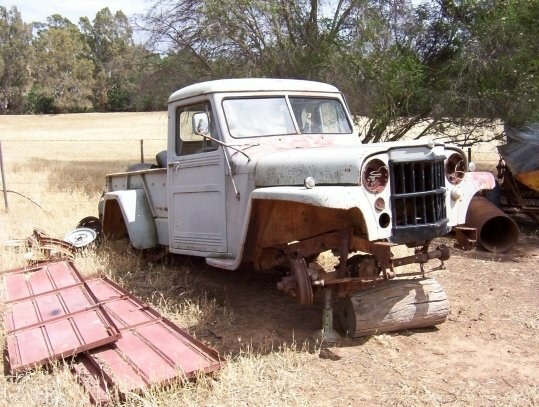 I love those old Willys trucks. Looks like this will be a great project. Nothing like old school with new technology. Thanks for posting this. I'll be watching this build. Thanks Dan and Dave. I was not sure to include the chassis part of the build on here being a metal shaping site. Thought I would just show some of the more interesting parts of it anyway to get a better idea of how it came together.